This electrical fundamentals program provides students with instruction in electrical installation and related skills, safety standards, tools and instrumentation, and terminology. Also includes electrical theory, industry mathematics, interpretation of blueprints and schematics, and the application of electrical laws. Students practice all skills in a lab setting on a stimulated residential structure. 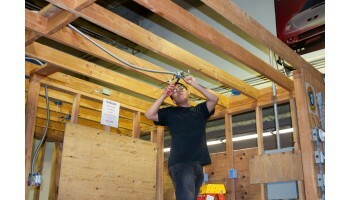 High school students must pass the Intro to Construction Careers: Electrical course or have similar experience. Camilla S. has successfully found employment as a Accounts Payable Technician after completing course(s) in Administrative Office Assistant. Markie S. has successfully found employment as a Physical Therapy Aide after completing course(s) in Physical Therapy Aide.